Look who I found fishing at Lake Katherine!!! 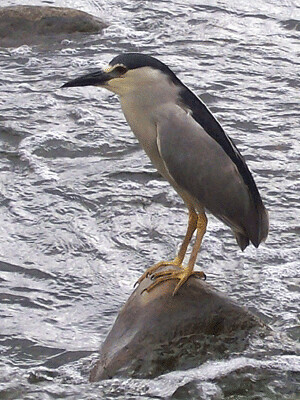 It’s my first Black Crowned Night Heron. 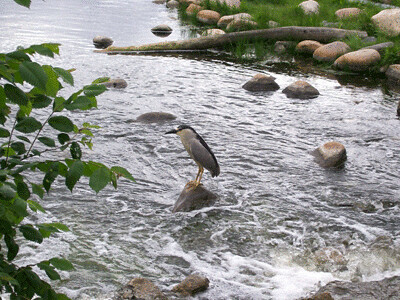 Here is an interesting note: Night herons are just like other herons except they feed at night. I took this picture at 5:30PM, so I guess he was having breakfast! He was very polite and allowed me to watch him up close. I was surprised! He caught 3 small fish and swallowed them whole which left a large lump in his throat for a few seconds. It was fascinating to see. Isn’t he handsome? Do you see that white line on his back? That is a really long feather attached to his head. So beautiful, it reminds me of hair. 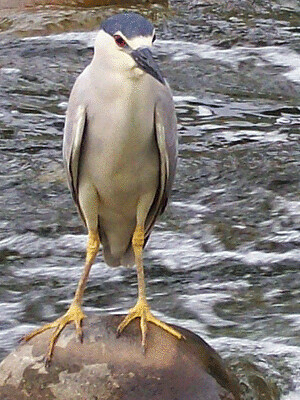 OK, maybe this isn’t the most appealing photo…poor Mr. Night Heron…..you look like a rubber chicken! I still like you though, especially your red eye! The Heron photos were fantastic! Also – love the new site! I will update you on all my blogs. Stunning Heron and love your new site! BRAVO! Wow, that last photo is especially amazing! Shelly: Thanks so much!I’m glad you enjoyed the heron and thanks for following me to this new site! Monarch: I couldn’t believe how close he was allowing me to get! Thanks for nice comment about the new site…I really appreciate it! Drowsey: Thank you so much! Doesn’t he look like a chicken! lol. Pingback: Let’s Paint the Heron! « Let’s Paint Nature! I love this new site! Brilliant concept. And the photos of the heron are magnificent. Pingback: Lake Katherine Wildlife « Let’s Paint Nature!